No matter the style you are looking for, there is a fireplace screen that can both look great and provide protection. This small spark guard comes in a simple, yet sleek curved style that will provide a nice accent to your hearth with the black finish. Also, this spark guard offers you the protection you need from sparks. This means you will be able to easily enjoy your fireside evenings with your family and friends. What is the depth of this UniFlame spark guard? Per the manufacturer, this is 6" deep. 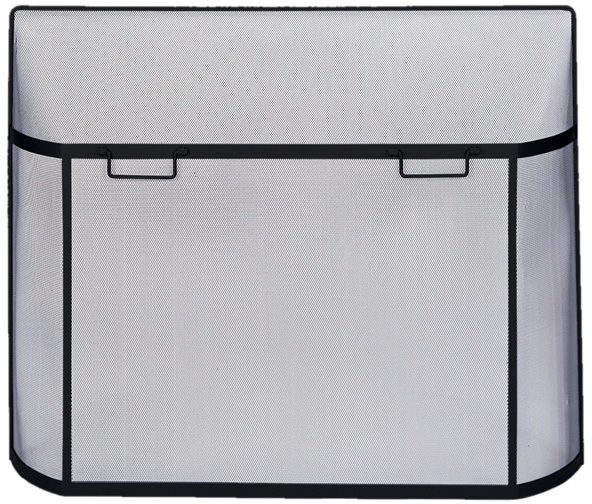 This is a great product for the price, certainly sturdier than the one we replaced. We burn mostly oak and locust, but use poplar to get the fire started, and it stops the sparks and embers dead in their tracks. It could not have been better. It was the best price, the cheapest shipping and it arrived in three days. You couldn't ask for more. Our fireplace screen arrived quickly and in perfect shape. The quality was much better than we expected for such a reasonable price. It looks great against our old stone fireplace and the size is perfect. I would recommend that you always measure before ordering your fireplace screen. I thought I was getting one big enough and it just wasn't tall enough. I had to give it away and as far as I know they like it and it is working fine for them. We've had several screens in the past, and this one is the best made one yet. It is very sturdy and of a heavier gauge than the others. We wanted to find a screen that would allow the heat to enter into the room and not block it. This screen is exactly what I was looking for and it was priced just right! We have a gas fireplace that gets terribly hot. The glass doors are very tempting for our toddler to want to reach out and touch. We bought this screen as a safety feature and it is working perfectly. It was received very quickly and with no shipping problems. Thank you so much for getting my fireplace screen to me faster than predicted. It is a beautiful screen and fits nice and snug to the fireplace. I can certainly recommend it. I am so glad we bought this fireplace screen for our home. It is very good looking and the design of the curved top does a really good job at keeping sparks from popping into the room. It is an inexpensive safety feature. I haven't actually used my new screen yet, but it passes the test on ease of assemblyand beautiful design. It is very heavy and seems to be made of real quality materials. I think I'm going to love it.